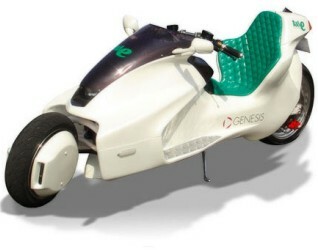 Axle Corporation, partnered with Genesis Corporation, has taken steps to overcome some of the greatest shortcomings of electric motorcycles, including insufficient range and lack of torque, with the introduction of the latest version of its Sumo motor and its Sumo motor powered EV-X7 motorcycle. The motor produces 2130W of power at 80% efficiency. It combines permanent and electromagnets to form a variable inductance magnet with improved performance. The EV-X7 motorcycle has a range of 110 miles with a fully charged battery. The battery requires six hours to charge. Its Sumo motor provides enough torque to climb a steep six-degree gradient at 15 miles/hr. The EV-X7 is being marketed as a quieter and more energy efficient alternative to gasoline-powered motorcycles. One full charge of its battery costs 80 yen (US $0.68) while a comparable 250cc motorcycle would need 4.5 liters of fuel to travel the same 112 miles, at a cost of 550 yen (US $4.70) at current electricity and gasoline prices in Japan, Axle explained. Research and development partnerships with companies and universities will be sought to develop additional products that use the motor's technology, Axle announced. Automobiles and household appliances were some specific future applications mentioned by the company.